near the downtown Hilton Hotel. In 1972, I was the youngest political reporter in Texas, and some of my older colleagues considered it a coup that I had been assigned to cover a presidential race, even though the candidate I followed that year was running for vicepresident. On a beautiful fall morning, I walked along a beach in Corpus Christi before going to the airport to join George McGovern's running mate, Sargent Shriver, for his campaign trip through Texas. In the first briefing about that day's schedule, the big news was that one of the stops would be in Dallas and that Shriver would visit the Kennedy Memorial. Married to Kennedy's sister Eunice, Shriver would be the first member of the Kennedy family to visit Dallas since the assassination and, therefore, the first to view the memorial just one block east of where the president was slain. It was a brief but solemn visit. Shriver walked inside the large "floating" white-walled concrete square and bowed his head toward the hewn granite block on the floor bearing the name John Fitzgerald Kennedy on all four sides. He had come to pay homage to his brother-in-law and not to give a critique on the sculpture itself. The memorial, dedicated in 1970, was designed by Philip Johnson, the architect of the Amon Carter Museum and later the Fort Worth Water Gardens. It was not well-received by a lot of people in Dallas at the time, as many couldn't grasp Johnson's concept of simplicity used to capture Kennedy's strength and free spirit. I've always admired the piece, and yet every time I have seen it -- which was almost daily for years -- I regretted that Fort Worth had resisted honoring the president here. Nothing in public acknowledged that Kennedy spent his last night here or that Fort Worth is where he made his last speech, saw his last art exhibit, made his last telephone call and perhaps heard his last prayer. Shortly after the president's death, a group of Fort Worth women started a campaign to honor him. The first plan was to have the city create a public square on the site of the parking lot where Kennedy made an unscheduled address to thousands who had gathered in the rain outside the Hotel Texas the morning of Nov. 22, 1963. When that idea was turned down, the women gathered 10,000 signatures on a petition to name the new Tarrant County Convention Center (a block away from the hotel) for the president. County commissioners quickly rejected that proposal. Commissioners eventually, on a 3-2 vote, were persuaded to name the convention center's theater for Kennedy, but they never placed his name on the outside of the building, which meant most people never knew it was the John F. Kennedy Theater. So when the theater was torn down in 2000 for expansion of the convention center, I'm sure I was among just a few who still had any sentimental attachment to it as it related to the Kennedy legacy. I wasn't sure I'd ever see the day, but finally Fort Worth has done the right thing in the right way to honor Kennedy's life and especially commemorate his visit to the city with first lady Jacqueline Kennedy. 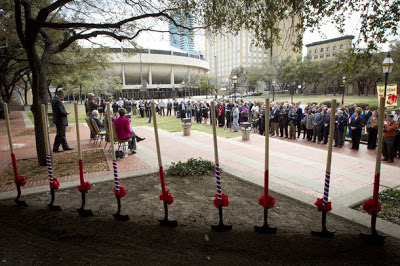 Business leaders Taylor and Shirlee Gandy and Downtown Fort Worth Inc. led the effort to raise $2 million for construction and maintenance of a sculpture in General Worth Square (the site of Kennedy's parking lot speech). The JFK Tribute is scheduled to be dedicated at 9 a.m. Thursday. I've had a sneak preview of this beautiful and powerful work of art, which captures the young president's love of life while vividly and sensitively focusing on that short but exuberant time he spent with the people of Fort Worth. It's a tribute of which all of Fort Worth and Tarrant County can be proud, and I can hardly wait to see people encounter it and interact with this piece of history that's come to life.